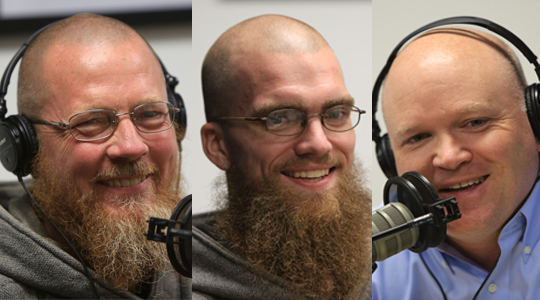 Summary of today’s show: Scot discusses a tech-free and prayer-centered lifestyle with Fr Michael Sheehan and Brother James Wartman of the Franciscans of the Primitive Observance. 1st segment: Scot Landry welcomed everyone to the show. He started by talking about the many religious communities in the Archdiocese of Boston. Today’ he’s profiling one of our newest priests in the archdiocese who is a member of one of the newest religious communities, the Franciscans of the Primitive Observance. He welcomed Fr. Michael and Br. James to the show. Scot asked Fr. Michael what it’s been like being a priest the past few months. He said he was very thankful to everyone at St. John Seminary for his formation. He noted that because their order is so small, the priests are ordained as Boston priests. They serve where the archbishop sends them, but their hope is to work in the apostolic work of the Friars. Scot said many of our listeners are familiar with Franciscans because of Cardinal Seán. He asked Br. James to situate the FPOs in the Franciscan family. He said as far back as St. Francis’ time, there were men who wanted to be Franciscans but didn’t feel ready to live the extreme poverty and so different kinds of communities sprung up. But the FPOs go back to the extreme practice if St. Francis. Br. James said he had first belonged to a different Franciscan community near Cincinnati, although he didn’t really know Francis that well at first. But living that ideal led him to a deeper appreciation. Scot asked Fr. Michael what it means to be primitive like St. Francis. Fr. Michel said it’s the four Ps: prayer, penance, poverty, and “fraternity”. In addition is the apostolic work, or ministry they do. They set the four foundation stones and then they build their apostolate on them. They are men of prayer and men of penance. St. Francis wanted to do penance for his own sins and the sins of the whole world. They listen to what God asks them to do as penance today. They don’t try to do what Francis did in an undiscerning, literal way, but try to renew and authentic gift and charism that was given to the Church. Br. James said their penitential practices are in general for the good of the Church. They make a fourth view to the Blessed Virgin Mary and entrust all of their merits to her discernment. Fr. Michael grew up in St. Catherine of Siena Parish in Norwood. As he grew up there, there were a handful of young priests who came through the parish and inspired him in different ways to think about the vocation. He didn’t understand what vocation was though. He thought it was choosing between two equally good things. Only later did he realize that all his interests and desires were given to thin to prepare him to choose the life that God wanted for him and to love it. The work of the young priests inspired him, but he still wanted a family life. But when he met the FPOs he saw they were a family of brothers. Fr. Michael said what attracted him in the beginning were the more extraordinary aspects: living without money or possessions, not knowing where your next meal is coming from. But over time, it became the more interior elements: making a good holy hour, the development of the virtues to make him a good Catholic and recognize the holy life. He’s still thankful for those great things from the early days, but it’s not what keeps him there. It’s the interior life. He went through three periods of formation. He first entered the community in September 2003 and began a three-year program of initial formation without any thought of direction to the priesthood. He started out just forming as a religious brother. After that, he traveled to Nicaragua for two years, one year finishing pre-theology and then a year off to live in that country, visiting people and learning the language so he could speak to them about Christ and teach them to pray. After that year, in the fall of 2008, he returned to the US to begin his four years studying at St. John Seminary. 2nd segment: Fr. Michael said the community has been in Massachusetts for 17 years, starting in the Fall River area at the welcoming of then-Bishop Seán O’Malley, then up in Lawrence, and now in St. Patrick’s Parish in Roxbury. Scot said people might assume that Fr. Michael took a plane to Nicaragua. He said four brothers just started their trip down and they will be hitchhiking all the way through the US and Central America. He said it’s part of the maturation process. They’ve hitched to Vermont and to Maryland. It’s placing themselves in the hands of the Holy Spirit and to be placed in the presence of someone who needs to hear a word or to listen to them. Maybe the Lord plants a seed through their just listening for ten minutes. Fr. Michael said they rely on BVM Tours (Blessed Virgin Mary) and she is the one who plans their trips. They started from Emmittsburg, Maryland, and went to Ontario to visit one brother’s family, then to Mother Angelica’s shrine in Alabama and they went from place to place over three weeks getting about five different rides per day. Br. James said there is a huge variety of people who pick them up. Sometimes they’d go to a truck stop if they wanted to go a long distance. Or of they were moseying, they’d stand on the side of the road. Truckers never stop for them there. They’ve never been harassed. They find people who are curious or in need. It becomes evident that God’s providence is at work in who picks them up. When they spend a long time waiting for a ride, Br. James said he thinks that the Blessed Virgin is planning a meeting for them down the road. They wear their rosaries on their belt so they can pray while waiting. Fr. Michael said the hitchhiking is part of the interpretation of the genuine renewal of St. Francis’s original vision. He had told the brothers not to ride horseback because that was how the wealthy got around. Now even the poor have cars, but the brother themselves don’t have a car. However, they do maintain their driver’s licenses so they can drive for others when necessary. Scot said so much of the life of his family is planning out the meals for his kids and the whole family. But when the brothers wake up they rely totally on the providence of God for the food for the day. Fr. Michael said they recognize that they aren’t just a couple of guys living together, relying on God’s providence. So they have a plan and one brother goes out one, two, or three times per week to get food. They also maintain a garden. All the other brothers also have a responsibility to recognize the generosity of their benefactors. Br. James said the first Capuchin saint was St. Felix, whose job for the order for 40 years was to walk around Rome and beg for food for the brothers. Those brothers with that job is called the quester. They get to know their neighbors by begging door to door and end up praying with people, inviting them back to church. Fr. Michael said it’s important for them to live off the generosity of their neighbors in such a way that they go out from the door to receive that generosity. They try to limit the amount of generosity that they receive from those who know them and bring it to their house. Instead they try to seek generosity from those who don’t know them. The spiritual benefit is that if they’re taking food from poor people, they themselves better be poor. Sometimes they are given the food that the family was cooking for themselves, which is a spiritual benefit for them. The experience of begging teaches everyone what it means to be poor and to be poor in spirit. Scot said Americans lift as an ideal their self-reliance and we are formed that way from childhood. What’s it like to go from independent and self-reliant to being dependent on others who themselves might be in great need. Br. James said he’s been doing it for nine years and he’s still uncomfortable begging because it’s so opposed to his nature as an American man. It’s a gradual weaning and change. If St. Francis hadn’t pushed it so much on his brothers, it wouldn’t have happened. He chose this way of life in order to live like Christ and the apostles who themselves went without what they needed. At the feeding of the five thousand, it was the child he had the food for everyone. It’s the poverty of Christ that inspired St. Francis. Scot said another kind of reliance and poverty is the loads of college debt that some men come to the Franciscans with. He said that this is a big problem for many young people in many different religious communities. Fr. Michael said he originally wanted to work off his debt, but he was counseled that if the Lord is calling him to the religious life, he needed to say Yes now an turn it over to the Lord. He needed the courage to say Yes and see what would happen. So he went to people to ask them to help him with his debt and they did help at the inspiration of the Lord. Just say Yes and receive it. 3rd segment: Scot asked them how they start their day. Br. James said they pray together as a community. They wake up at 1am to pray the Office of Readings. They return to bed and return to the chapel by about 5:30am for Morning Prayer and then Mass at 7am. After Mass he used to start his walk to the seminary. At that point they go about their work. Most often they come back at noon for Midday Prayer and then Evening Prayer and a holy hour at 4pm. At about 8pm, they pray the rosary together and then the lights come on again for Night Prayer. They sign a hymn to Our Lady followed by time they could go to bed or study or to have free time. Most go to bed. Br. James said he visits a local jail once per week. They are beginning to visit a few others in the area. He does some carpentry for local families, like fixing doors or other handyman projects. He said once word gets out that he can fix things, the work finds him. Fr. Michael said he’s doing more sacramental work, including Masses and baptisms and other sacraments. He can be on call for the local hospital. Even so, his life as a priest is similar to the religious brothers in the community. The priests make themselves available walking through the neighborhood, to take time to talk with people. They go door to door and talk to people about the Lord and necessity of having a relationship with God. A lot of ministry can be initiated that way. He encountered one Catholic family with seven kids who hadn’t been baptized. Br. James said his most moving experiences are when people who’ve been away from the Lord recognize someone who’s happy in life because they’re with God and they want to taste that. Fr. Michael said growing up in the suburbs Roxbury had a stigma, but their desire is to live with the poor. When they were looking for a place to live, they had to be with the poor and Roxbury was included. Roxbury has a Catholic parish and a school and a neighborhood concerned with people eager to change and a desire to support and protect the family. They lived in East Boston for two years in a regular apartment when they heard about this location in Roxbury. They kept coming back to that place and they determined they were called to there. Br. James said they don’t hear the news and he’s not from Boston so he’s not familiar with the stigma. Nevertheless he sees young men on the street in trouble and drifting without direction. But there are a lot of loving families behind them and wholesome people. On Sunday, the church is full and the Masses last for hours. They are happy to be there and not anxious to leave. They walk down the street during the week and see kids outside playing, not inside playing video games, so it’s all there for them to be part of. Scot noted they have no TV, no phones, no computers, nothing like that. They are on a permanent retreat. He said they are dependent on the Blessed Virgin Mary to intercede for them in their needs. Fr. Michael said the home in Nazareth is really big with a lot of space for all of us. Having their own home free from all those appliances gives them time and space to do more of the work of prayer and service, keeping them from being anxious or dependent. They invite more people to their lives like that, even if they have those things. It’s not the things that are the problem, but our enslavement and attachment to these things. When things go wrong with those things, it’s an opportunity to pray with the Blessed Mother who had many challenges with the poverty she experienced in Nazareth. The silence of the years in Nazareth allow us to inject our experiences into that through our imaginations, spending time with the Blessed Mother, and have her teach us how to act and live our lives. Scot asked Br. James about the call to religious life. Br. James said the desire to grow in holiness is most fruitful in community life. Fr. Michael said there are brothers that need each other. They see the talents they provide to the community as well as the gifts of the other brothers in helping them develop. Fr. Michael asked for prayers for them and for the challenges every day, to think of them when the listener is going through something difficult, asking for their sacrifice to help them. Scot suggested listeners look them for them hitchhiking around.